﻿ Once we went to pick up my brother from airport home. While waiting for his flight to arrive, myself, the hubby and my two cousins were wanderering here and there in the airport exploring the new construction which is going on still. I was so tired standing near the guests gate. So my sweet hubby brought a luggage trolly and made me sit on it . He moved the trolley I was sitting. I adore him. 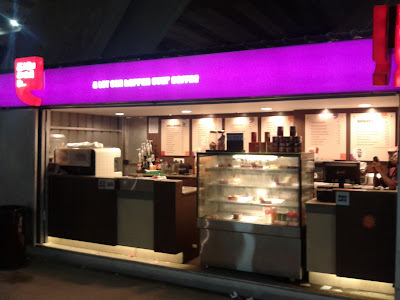 While wandering , we got a look at the Cafe Coffee Day. Not just Cafe Coffee Day. It was the smallest Cafe Coffee Day. There were no chairs or couch. We need to hangout there standing. But we wanted coffee badly. Myself and my cousin check out the prize of the coffee. It was costing around 200 bugs rounding off. We silently ordered a choclate cake and moved to the shop opposite to it. It was a South indian Coffee bar. We bought coffee for just 20 bugs rounding off... Not to mention the small piece of cake was 75 bugs. We muched our cakes and made fun of the cockroaches in the Coffee bars showcase. This made the owner pissed off. We were forced to leave the place. A crappy incident, just to post the Small Cafe Coffee Day shop picture.